The organizers of Ukraine's first major gay pride march claim that around two thousand people turned up on Sunday, June 12. "This is the first largest, most open and peaceful Equality March… We're still calculating how many participants have come, but a tentative number is about 2,000 people, which is a huge stride forward," representative of the Kyiv Pride Department Ruslana Panukhnik said at a briefing in the Ukraine Crisis Media Center on Sunday. She claims the Kyiv Pride 2016 has become the largest event for the equal protection of LGBTI rights in Ukraine's history. She said that in previous years, the Equality March gathered from 80 to 300 people. "I'm grateful. We've achieved great advances towards an ideal peaceful demonstration for human rights, including LGBTI rights," she said. She thanked the National Police, Kyiv City Administration, representatives of diplomatic missions, international organizations, Ukrainian human rights organizations for the support of the Kyiv Pride. Participants in the event confirmed that it was absolutely peaceful. Read alsoNational police report 50 people detained during LGBTI Kyiv Pride on Sunday"There was only one incident about 1.5 hours after the event had ended. A man has been beaten, he is now in hospital with our lawyers," she said. She also mentioned an unpleasant happening in connection with the police: when participants in the march were getting into buses that were to bring them outside the city's center, some police officers made anti-gay jokes and allowed insults while passing by the buses. 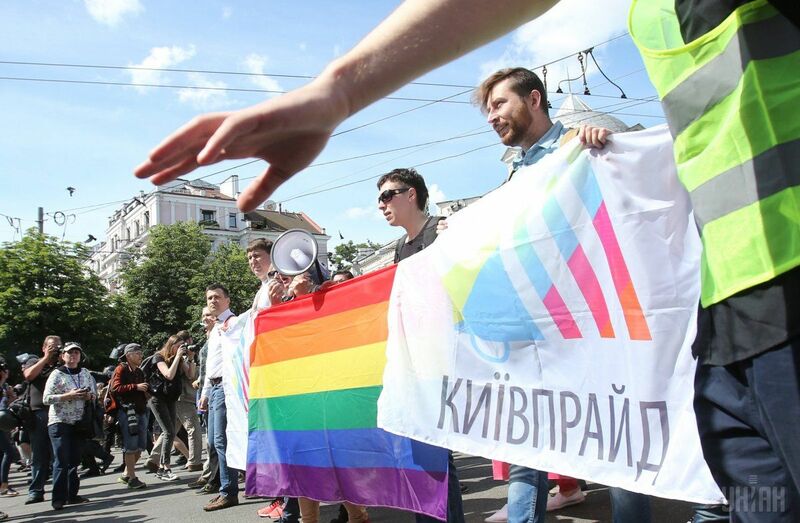 Read alsoSome policemen don't want to guard LGBTI pride parade in KyivUkrainian gay rights activists expressed hope that in future the society would become more tolerant so that LGBTI parades should not require unprecedented security measures. Ukraine's regions will be more actively involved in the LGBTI movement, and Odesa will host its second Equality March this year, the activists said. Chief of Ukraine's National Police Khatia Dekanoidze reported that 1,500 people had taken part in the Kyiv Pride 2016, and almost 7,000 police and other law enforcers were guarding the procession.